Why this workshop is important for who want to become an Actor? The Acting Workshop is Powered by Aayushi RytEve, presented by IFDS Film Academy …When an Actor is going to a film audition; shoot film or theatre arts, there biggest challenge is usually preparing emotionally for the role. If this is your first time in front of the camera, it is very stressful which totally works against giving your best performance. This workshop will help you learning breathing techniques which can aid your nerves, there are ways to make you sure that your performance is memorable. If you attend this Workshop you would get ride on stage-fear, Good performance on stage, making a good characters in films, definitely you would get boost your confidence as an actor, as a speaker, as a presenter and good performer. Come join us for acting workshop - learn acting Techniques and perform incredible. - It is full day Event and opens for ages -17+. - It’s open for everyone irrespective of experience and interest persons. - Please ensure you are the available for the complete duration of the workshop. - Certificates will be awarded to all participants. How to develop acting skills? How to give an audition? How to choose characters for our personality..? Body language: Yoga, mime, Movements. Dialogue Delivery: Diction, Memory, Modulations…Etc. Emotions: How to improve our acting skills on emotions (Navarasam). How to improvise our acting skills on set/ locations. 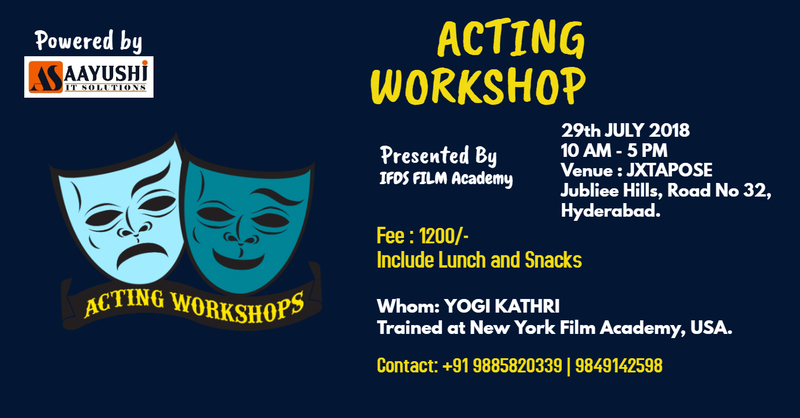 Acting Workshop by YOGI KATHRI, Trained at New York Film Academy, USA. Artist at Telugu, Tamil film industry. Date - 29tth July 2018. Cost for 2 participants joining together in the same 15% workshop per participants. Cost for 3 participants joining together in the same workshop 25% per participants. Please note: To avail the discount, payment has to be made together; participants can register before 24 hours of workshop. If not register before 24 hours offer will not applicable.